Hi everyone! Remember last year how I wrote about Glideware's Kickstarter campaign? The good news is they reached their goal and made it to production. Now they are ready for YOU (and me!) to try it out. This guest post was written by Heather @ Thift Schooling about using Glideware. I have to say that I'm impressed, and since I currently have a set of frying pans stacked in each other and very close to landing on my toes every time I go for one, Glideware is very much on my "kitchen upgrade" list. Last year, I introduced you to a brand new product in the making, Glideware. At that point, the company was only in it's beginning stages. Now, only a year later, Glideware has grown leaps and bounds. After an extremely successful Kickstarter campaign, Glideware was able to raise the funds needed to get their product into production and into the hands of the consumer. 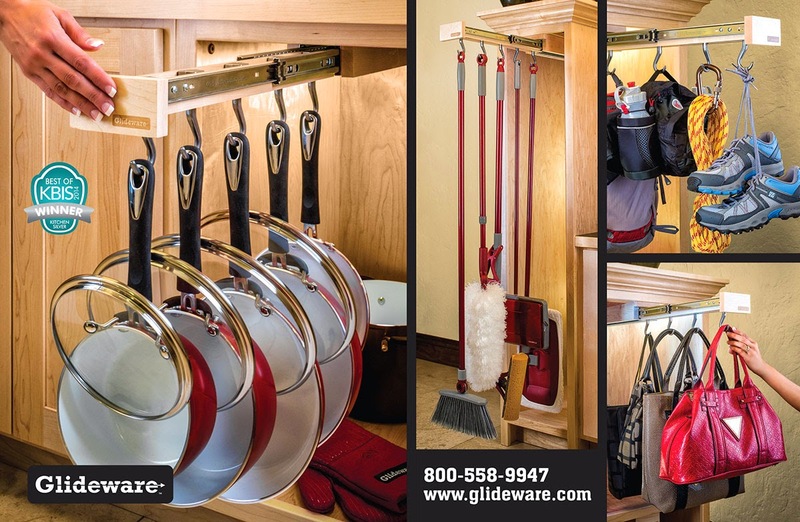 Recently, Glideware has been showcased in Kitchen and Bath Design News Magazine, listed as one of their creative storage solutions. Glideware was also featured in Builder Magazine and even Bob Vila listed it as one of 10 New Kitchen Products to Make Your Life Better! And I will tell you from experience, that this product does in fact make your life better! Seriously. Look at how I stored my pans in my Pre-Glideware days. How sad. And now? I can access my pans with ease. And yes, those are CAST IRON pans. I wasn't sure at first if this product would hold my heavy duty cast iron collection, but actually, it works wonders! The problem I always had with these pans was the weight. Having them stacked on top of one another was clearly not ideal and trying to lift the top pans to get to the bottom one was not good for my wrists! Having Glideware installed in the cabinet right next to my stove has clearly saved time and reduced frustration when working in the kitchen. I use these pans pretty much every day, so having an easy storage solution has made my cooking experiences run more smoothly. The fact that the pans are hanging separately and not touching one another helps to keep them in pristine condition. If you are storing stainless steel or non-stick pans, then using Glideware will help prevent them from from scratching one another. For me, I've noticed that it helps prevent rust on my cast iron pans since they aren't touching each other. When you order your Glideware unit, you will receive what is pictured in the far left photo. All you will need to install your Glideware unit is a simple screw gun. Ours was installed in a matter of minutes! Once your unit is in place, you can attach the seven metal hooks. I like that the consumer can place the hooks themselves so they can space them out according their own particular needs. In my case, some pans are wider than others so I like the option of moving the hooks back and forth as needed. For $199 you can make life at home a breeze! Whether you simply want to give your old kitchen cabinets a makeover as I did or if you are working on a remodel, consider making room for Glideware, you'll be glad you did! 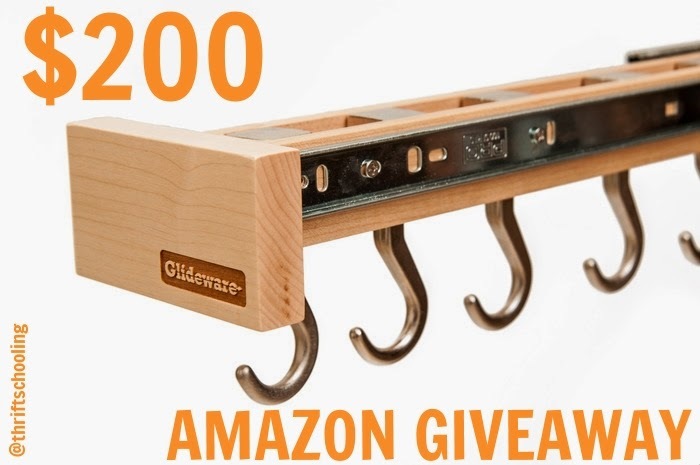 Glideware has graciously offered a $200 Amazon Giftcard to one of my readers! Simply enter the Rafflecopter below for a chance to win!